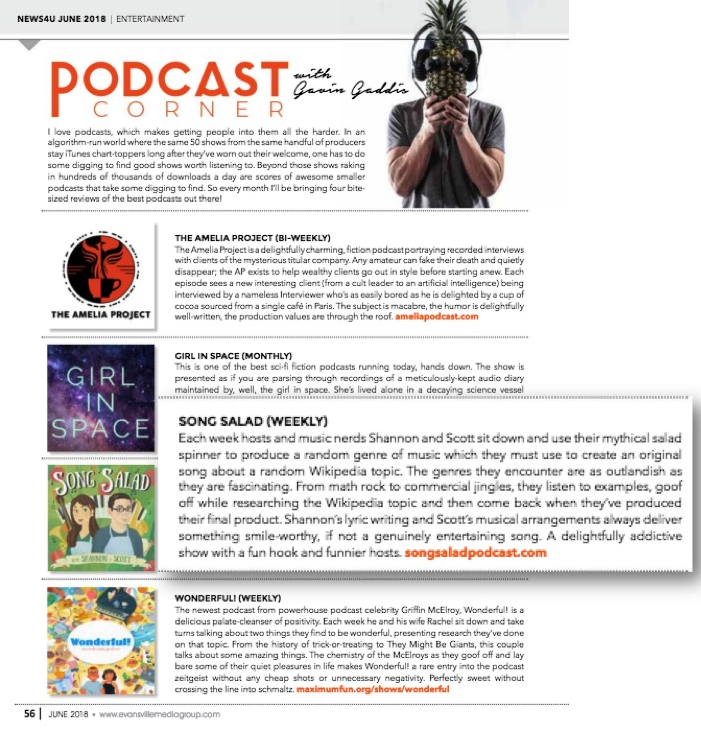 "I usually like to include critical feedback when reviewing podcasts, but I found myself coming up completely short with Song Salad. It’s as show I’ve only been familiar with for a few weeks but has already become a strong favorite. It’s a podcast that does something different, that perfectly combines its conversational qualities with its educational qualities, a podcast with hosts as charming as their structure and concept." "Pound for pound, Song Salad delivers more smiles-per-episode than any other non-fiction podcast I am current subscribed to. The hosts have great chemistry, the concept is solid, the content is varied, the humor is genuine." "If the premise alone somehow isn’t enough to win you over, Song Salad isn’t just its setup: it’s also a funny podcast hosted by two of the most loveable, goofy hosts in the medium." Song Salad is specifically nice for road trips not just because it’s funny, but because it has segments and a song each episode, which helps it give some variety to the drive.